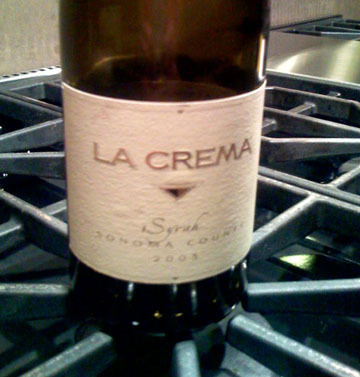 I am not normally a big syrah fan, but I opened this the other night and thought it was really good. Especially considering its price point at $18. Not sure if you can still pick up a 2003. I have had mine in the cellar for a while. It appears that the 2004 is currently available on their web site. I enjoyed this Syrah due to how mellow it was. It was very smooth and fruity with just enough of that leathery Syrah taste that at times I find overpowering with food. I served mine with a grilled beef tenderloin with orange chipotle vinaigrette accompanied by sauteed fennel and yellow squash. It seemed to work fairly well. I have been to The Herkimer at least 400 times. Well not really but let’s just say I have experienced all of their menu changes over the years. Not familiar with Herkimer…its the only brew pub in Uptown. Historically I have not been a big fan of their house made beer but I will say that they make MUCH better beer overall then Granite City. Granite City in my opinion does not have a single good beer on tap. My least favorite Herkimer beer is the Red Flyer. I am a HUGE fan of this style of beer but there has always been something wrong with the Herkimer version. Someone described it perfectly the other day when they said it tastes “soapy”. With all that said… I went to Herkimer last week and I was very pleased with 3 things. I enjoyed their Weiss. In my opinion they do a fantastic job with this beer. It is light and fresh, fruity and perfect for sitting out on their patio. I love this beer. They had a Tuscan Grilled Chicken Sandwich that was also really good. It had roasted red peppers, provolone and sun dried tomato pesto. It was cooked perfectly and was a nice alternative to their burger. I really hope they keep this on the menu. Note: the puerco sandwich is also good. They have a new beer (since the last time I was there) called Sky Pilot. I am not usually a fan of Pilsner, but this one was outstanding. I can see why they won a gold medal for it. I found it complex and refreshing. It also went exceptionally well with my sandwich. Herkimer now takes reservations on Open Table. From what I understand they serve a good breakfast as well. Parking right now is challenging due to road construction…. They did it again. Another Outstanding meal at Chambers Kitchen. This is turning into my favorite place to dine in Minneapolis. The meal once again was flawless, unique and totally memorable. We tried 2 new appetizers and entrees. We started with the Rice Cracker Crusted Tuna Siracha-Citrus Emulsion. The Rice cracker added a nice texture to the dish. It was lightly seasoned and crunchy. The tuna was deep red and gorgeous. It was excessively fresh and perfectly cut with no gristle. If you are a raw tuna fan, do not miss this one. We also tried the Chicken Samosas. They were very good but not as stellar as the tuna. I enjoyed the dipping sauce that came with them. For my entree I tried the Duck a L’Orange. It went well with the Bottle of St. Innocent Pinot Noir I ordered. The duck was cooked to perfection with the pear and ginger being a nice complement to the citrus glazed duck. We also tried the Salt and Pepper Walleye. It was reported that this was good but not all that exciting. The fish was breaded and fried. Service was outstanding. They even brought covers for our entrees when my dining partner left to use the restroom. I remain impressed with the wine list at Chambers Kitchen. The wine we ordered was a limited release of 875 cases. It was reasonably priced and worked exceptionally well with our dishes. Took a week off and went to Mazatlan, Mexico. It is actually a nice time to go because there was virtually no tourists. The plane was almost empty on the way down and we enjoyed a fairly empty resort. I won’t bore you with the details of the vacation, but here are the good points and not so good points from a food perspective. The Beer, Why does the beer taste better down there then it does up here. Pacifico, Modelo, Corona, and Negra Modelo are made in Mazatlan. Must just be fresher. Grilled Whole Red Snapper. They serve it with the head and tail on. We had 2 versions of this dish. El Captain was the clear leader here. The fish was tender juicy and caught the same day. They serve it with rice. The bottle of Los Vascos Chardonnay 2004 I had. Nice dry chardonnay from Chile. Inexpensive not too oaky and delicious. Molcajete – Kind of like a variation on Fajitas. They heat up a large stone bowl. Put some kind of spicy sauce in the bottom. Then they cook onions (whole) , meat, tomatoes and cheese and put it inside. The process is still unclear to me but however they do it it was awesome. Homemade tortillas. Again I have not had anything as light and workable as the ones made in Mexico. The stiff store bought ones you get from the grocery store are crap in comparison. Caramel Flan. I am going to try and replicate this. Will post the recipe at some point. The prices. Our average dinner for 4 including drinks was around $60 with the tip. The fish taco I was served. Not sure what was going on there but it tasted like dried crunchy fish tortilla chips in a soft shell. Wine and Cheese tasting at the hotel. This was a total joke. I was served a white Zinfandel and actual cream cheese (just like you would put on a bagel). They also served blue cheese that was rolled in wickedly hot chili powder. Mexican wine in general – Let’s just say they should stick to making beer. OK one more comment about the white zin. What a horrible wine this is. Tastes like a wine cooler with no bubbles. Definitely the ugliest thing on the trip. I knew it was bad but had no idea it was this bad. The menu at the “fine dining” place we went to. The waiter comes out with a tray of frozen, shrink wrapped meat and lobster. With a board that has the title of each and the price. I ordered the fish fillet because it was the only fresh item they had. I would doubt it was fresh. I assume all of the items on my plate were frozen and reheated. This was the most expensive meal we had at $95 for 2 including a bottle of wine. And it was also by far the worst meal we had. The wine list at the same restaurant. This is the only wine list I have seen that did not include a vintage for each bottle. You could buy a bottle of Cristal for $1000 at the high end. At the low end a bottle of Woodbridge Chardonnay for $45. Actual retail on the Woodbridge is about $5. I guess it is considered an import in Mexico (still laughing to myself about it). I would consider it a TOTAL rip off.